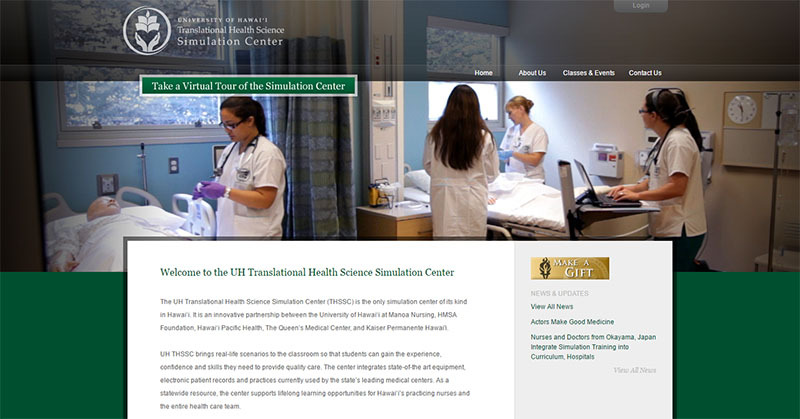 The University of Hawaii’s newly built Translational Health Science Simulation Center (THSSC) required promotional media to support its cutting-edge facilities to prospective students and their families, other nursing programs, medical-industry professionals, policymakers and the general public. The media needed to showcase the groundbreaking technology being employed at THSSC, but also stress the importance of caring and human interaction in nursing education. We designed and built a website, interactive tour and produced several videos. We designed an interactive user interface which allows visitors to navigate the THSSC in a stylized floorplan. Each area of the facility was highlighted by 30 second to one-minute-long videos produced by Hyperspective. The videos simultaneously engender excitement in the prospect of attending the nursing program while also reinforcing the human interaction necessary to learn alongside the facility’s highly innovative technology. The THSSC website has created great interest among target audiences since the facility’s opening. The site generates traffic, providing facility administrators with contacts to prospective students and industry professionals eager to visit in person. THSSC staff use the content management system environment to update the site content as they need.